The full back three seat sofa from the Classic Series from Lesro is a chair that should be in every reception area. It is a traditional look that is pleasing for any taste. The full back three seat sofa from the Classic Series from Lesro is a chair that should be in every reception area. It is a traditional look that is pleasing for any taste. 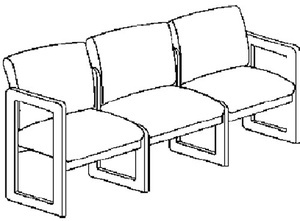 Tried and true best describes the Lesro Classic Series of reception seating. With their distinctive ergonomic backs, these are beautiful chairs add a classic look to your reception area. The modular nature of all Lesro furniture allows for complete layout flexibility to customize your reception area. Inside sofa measures 64" x 18-1/2" x 15"